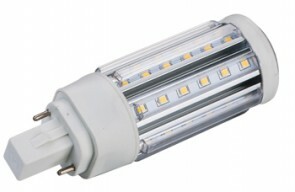 The Heavenly G24 lamps are designed to replace traditional fluorescent ones. They are offered in two wattages 7W and 9W. Featuring a wide beam angle, these lamps are commonly used for indoor recessed downlighting.with a 360 illumination range. Replaces CFL 18W lamps in existing and new downlight applications and Delivers 600 lumens, equivalent to the delivered lumens of a traditional 18W CFL.